I am traveling today, at the beginning of a stretch where I will spend time in airports over coming weeks. I have had a long stretch of writing projects, most notably my new book Stick Figures: Drawing as a Human Practice, but also including substantial essays on Norman Rockwell's Four Freedoms and N.C. Wyeth's advertising work for an upcoming retrospective at the Brandywine Museum. I have missed drawing, which is hard for me to do when committed to writing projects. So my travel is well-timed. Airports are excellent sites for drawing: the people, variously costumed and occupied, are one thing. The goings-on around the airplanes are another: fueling, loading, etc. Finally the spatial ambiguity of inside/outside and the remarkable aircraft themselves give a composter plenty to work with. 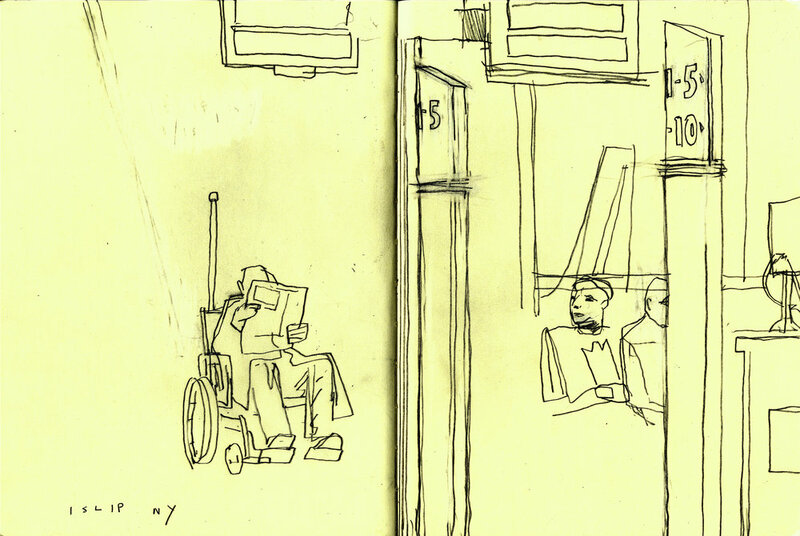 I have drawn in airports a lot, especially during a stretch between 2008 and 2011. As I adapted to a more journalistic approach during those years I created a lot of method studies from airport drawings–some formal, some quite tossed off. I'm posting several drawings here, two of the same subject: the old (now closed) Air National Guard station at Lambert Airport. There were two Cold War era military aircraft, mounted like dead birds as trophies. Before that, in a more reportorial spirit, an early morning view from Lambert Airport in 2011. And a drawing made on the back end of that trip to NY, after a dislocating storm required us to fly from Long Island instead of LaGuardia. My students are working on a project that requires more elaboration, which is part of my task today in this liminal space of air travel. We ran long yesterday. Group! Here is the drill. Follow this link to a discussion of the Picture Lotto project. The examples and discussion are worthwhile, if a little sprawling. Scroll to the bottom of the post beginning "SEPTEMBER 2018" for explicit instructions. In short, you are going to have fewer (12) things to make, with a choice between an objects- or people-oriented prompt. The reason for the choice might be formal, or it might be thematic, but for now the choice should be made purely on the basis of what you feel like doing. That is, your inclinations will be instructive. More evidence. D.B. Dowd, Pre-Dawn Flight to LGA. 2011. Gouache and digital color. D.B. Dowd, Airport, Islip, NY. 2011.Sketchbook drawing. D.B. Dowd, Air National Guard Station Entrance (constructed), Lambert Airport, St. Louis. 2010. Gouache and digital color. D.B. Dowd, Conflated Subjects: Airport Parking and Air National Guard, 2009. Gouache and Digital Color.